Sometimes life doesn't go as planned. From unexpected job changes to an extra child in the family, Life has many twists and turns, but these choices are part of the fun in the Game of Life. Hasbro's classic board game, The Game of Life, has been a family game night favorite. As your car travels along the path, players make decisions and have changes thrust upon them. Choose a career path or college life and collect your salary throughout the game. Following marriage and kids, should you buy a house? In between these decisions, action cards bring levity to the mundane. From making your opponent laugh to winning at a game of chance, these action cards can help fill your bank account. Winning the game is simple. The player with the most money at the end of the game wins. Did you career decision help or hurt? Should you have sold your home at the right time? Just like real life, The Game of Life is all about the right decisions. Our family has played this game on several occasions. One child always chooses the quickest path to the end. He doesn't go to college, doesn't have kids and never buys a house. It's funny to see if we can out think his fast paced pay. Sometimes our gambles to take our time work and other times they don't. When it comes down to it, we can never predict the final outcome, just like life. The Game of Life includes: Game board, 6 Plastic Pawns, Pink and Blue "People" pegs, 1 bridge, Label Sheet, 3 Mountains, 25 LIFE tiles, Banker's tray, 7 Buildings, 24 Spin to Win Tokens, Spin to Win Strip, Deck of 54 Cards, Spinner Base, Ring and Dial, Stack of Play Money, Bank Loan and Pay Raises and Instructions. The game is intended for ages 9 and up. It is played with 2 to 4 players. The Game of Life by Hasbro retails for approximately $19.99. 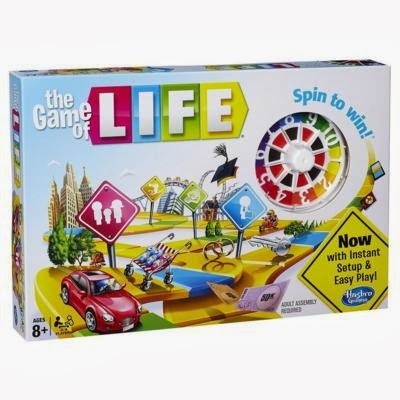 Would you like to add the Game of Life to your family game night library? Please use the Rafflecopter to enter. Disclosure: I received this item to review and to giveaway. All opinions are my own. Monopoly! Thanks for the chance. For Christmas we bought a newer game called Magic Jinn that the kids love playing. Simple Words, a puzzle matching game with our little girl. I like playing Monopoly, but I want to get the Game of Life Dogs edition. We like to play monopoly or clue.